I’ll be adding something new in the end of this post during the next 7 days. Come back whenever you remember to read something new, see what perfume I chose to wear, share your SOTD (even if it has absolutely nothing to do with irises) or just talk to me and others. Can you believe it’s Week 4 of the Month of Irises? I still have perfumes for the next 7 days, and I’m curious to see what others find to wear. There were no more “takers” for hosting an Iris Day so I’ll be doing all the daily updates (but if anybody wants to take over one of the remaining days, you’re still welcome). I enjoyed wearing Chanel No 19 extrait so much that I decided to stay with Chanel for one more day. I will be wearing No 19 EdP. Rusty got really interested with my origami experiments. I’ll try to add a GIF for tomorrow but meanwhile just a teaser. Following Lucas’s lead, Hedonist Iris by Viktoria Minya. 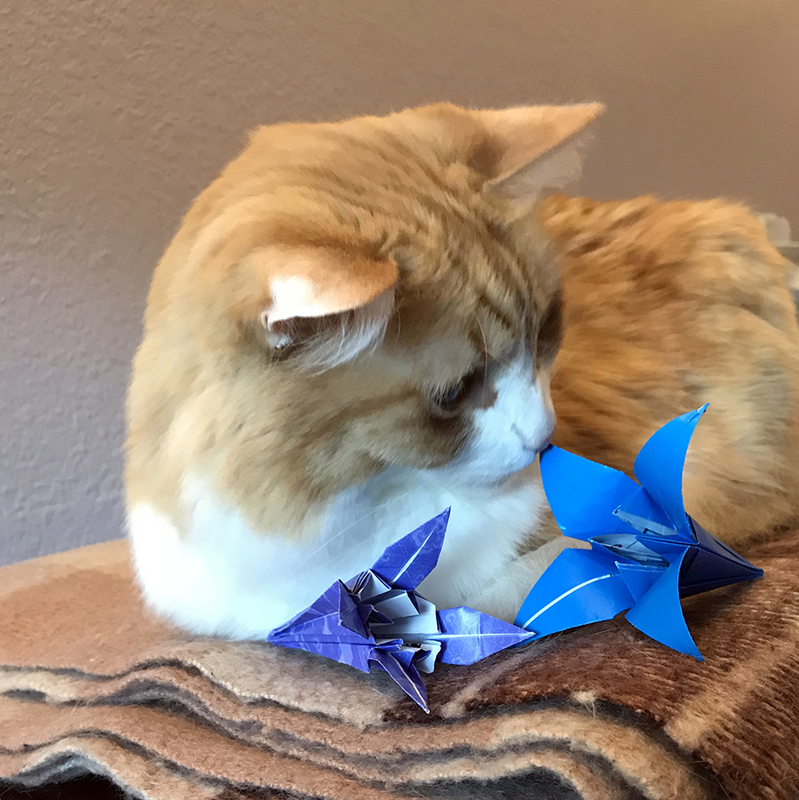 If for nothing else, it was worth making those origami irises because Rusty was really taken by those. Probably I should make a couple more for him to play. I’ve been postponing it, but it’s probably time to finish my decant of Iris Silver Mist by Serge Lutens. I think it is one of perfumes that has such an iconic standing that it is difficult for it to live up to itself. Have you seen this already? A note pad from Japanese company Triad that reveals architectural models as you keep using it. I do not really use paper notes but I love the idea (and the color! and have you noticed those irises on the base?). If $123 + $21 S&H doesn’t scare you away, click on the picture to pre-order this Omoshiroi Block Japanese Landmark Memo Pad Kiyomizudera Temple, Asakusa Temple, Tokyo Tower notepad or one of several other designs (I’m not affiliated). I decided to give Iris Silver Mist one more wear. While it was nice, I don’t think I like it more than several other irises I have or tried this month. So once I finish my decant (probably one or two more times), I won’t try to get a bottle. Maybe another decant. Recently I was watching (again) Hercule Poirot series and was reminded how much I liked the song used in one of the episodes – Yellow Iris. Unfortunately, from what I managed to find, it had never been released as a stand-alone song, so all you can do is to listen to it in the clip from the episode (in which, by the way, there is a reference to the flower of the month – so I thought it was at least partially relevant). The song is beautiful, and I wanted to share it with you (and I’ll add lyrics under the video – in case some of the words are not clear in the background). The way you walked, the way you talked, the things you used to say. Whether your eyes were blue or grey. With just 2 days left in the month I’m going through the remaining list of my iris-centric perfumes choosing carefully what gets a wear within this project. 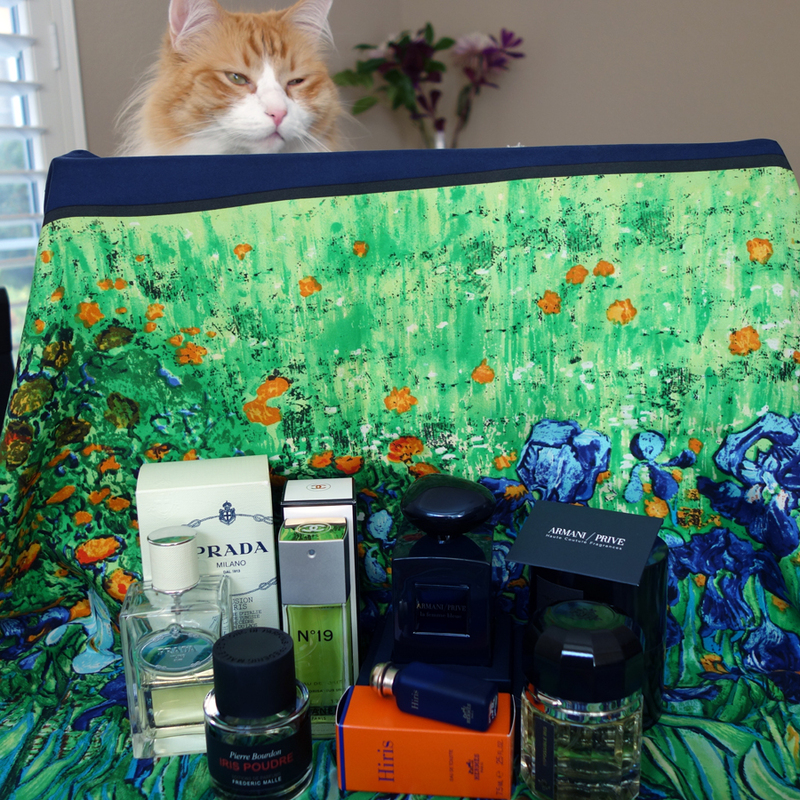 I’m going with my first unsniffed purchase – Chanel No. 19 Poudré, even though I suspect it might be a little too cold for it. So we are on the last day of A Month of Irises project. After it’s over, I’ll probably do a round-up post with some statistics – so please, keep going, do not give up until the end of the month (and report back). I thought it would be very fitting to finish my updates for the month of irises, rainbows and perfumes with a link to Asali’s (The Sounds of Scent) review of the legendary Iris Gris perfume – At the end of the rainbow. I started this project with a list of iris perfumes that had more than 28 scents, so it is not a surprise that I had a choice of what to wear for the last day. After going back and forth between a couple of contenders, I decided that Hiris by Hermès would be a perfect conclusion for the month: it is very office-friendly (and I have some meetings in a small office), it is a classic iris perfume, it is the last perfume featured in the picture of the introductory post for this project that I haven’t worn yet, and this mini bottle was a gift from dear Portia (Australian Perfume Junkies). New Year resolutions… Crowds in gyms and dance classes usually subside by mid-February allowing regulars to go back to their normal routines. Healthier eating habits get buried under stress of a “holiday-less” life and kitchen catch-all drawers stay in their natural state that makes finding any useful thing we put in there at some point an adventure. In the beginning of 2011 I decided to see at least one of my New Year resolutions through. The resolution was: I will wear one of my favorite perfumes at least two times a week. 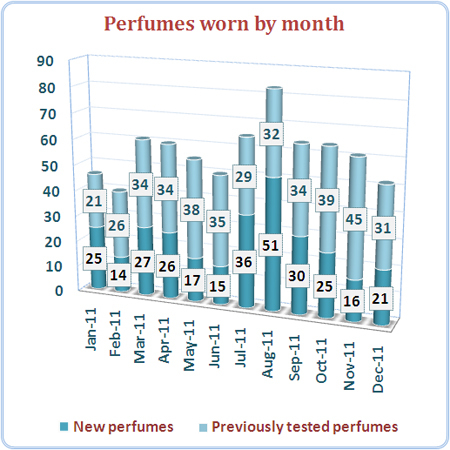 By that time I’d created already a database to hold information about perfumes in my collection. So all I needed to add was a diary part where I could record my perfumes usage. I’m proud to report that in all twelve months of 2011 I followed my NY resolution and gave perfumes in my permanent collection the attention they deserve. In addition to that, my numbers collecting provided me with a lot of interesting though probably not that useful data points which I’d shared with my readers in the Quick stats section of my monthly reports. I was very curious to see the numbers for the whole year. So, here they are. Coming up in the next couple of days New Year Resolutions, Part II: Perfumed resolutions for 2012. There are people who love running, playing tennis or swimming. I heard they can experience a withdrawal if they have to skip several training sessions. It’s not my story. I hate exercising as long as I can remember myself. I do engage in different activities but do it out of the necessity only: if I could get Kathleen Turner’s body and don’t worry about my health without exercising I wouldn’t (I wonder which perfume bottle she’s holding in that scene). Well, since a lean gene wasn’t one of those passed to me from my parents I do my part in at least keeping myself healthy. At least as much as physical activity, if not more, I dislike heat. I don’t like cold either. My comfortable zone is somewhere around 24°C (75°F). All that makes it hard to explain why out of all available types of physical activities I chose Bikram yoga – a system of yoga practiced in a room heated to 40°C (105°F). I’ve been practicing Bikram yoga (with some breaks) for 18 months. I still hate every minute of a 90 minutes class. But I plan to keep doing it. For me yoga is just an exercise. I do not subscribe to the philosophy. If I follow the breathing instructions I do it only if it helps to maintain the posture. I do not try to clear my mind and concentrate on what I’m doing. I’m not pushing myself too hard. I’m just trying to survive. One of the things that help me through the class is thinking about perfumes – about which I read or plan to write or which I want to try. For a long time I tried not to wear any perfumes to my classes thinking they wouldn’t perform well in high heat or would bother me or my neighbors. And then one day I didn’t think about the class I had scheduled in the evening. I wore a perfume to the office and even re-applied it mid-day. By the time I started the first breathing exercise I forgot about it. And when my body heated up enough suddenly the perfume started blooming on my skin. It was magical. It was much more interesting than what I experienced earlier that day with the same perfume. It was Serge Lutens’ Boxeuses. Since then I started experimenting with different perfumes. I apply just a little bit of a perfume in the décolleté area and on my wrists an hour before I go to the class and then during JanuShirasana or Pavanamuktasana I inhale wafts of the hot air mixed with moisture and perfume particles. It makes my classes go by faster and gives them some additional purpose. Perfumes that performed the best under such strange conditions: another Serge Lutens’ creation – Ambre Sultan, Ubar by Amouage and Alahine by Teo Cabanel. Tom Ford’s Arabian Wood, Chergui by Serge Lutens and Mitzah by Dior were very nice but didn’t survive Garudasana (approx. 15 minutes into the class). All three were applied from a dab vial so maybe a more generous spray application would produce a better effect – I’ll re-try them when I get those into my collection. No 19 Poudre by Chanel didn’t work at all. Not possessing a remarkable staying power as is, it disappeared from my skin by the time I unfolded my yoga mat. It was a strange experiment but I thought that maybe it had some hidden powers. It didn’t. I remember reading on one of the blogs that I always read a topic about a “treadmill scents” (or something to that effect) but now I can’t find that post. If an owner recognizes it from the description or if you covered this topic in your blog, please post a link. What is your torture of choice and what perfumes (if any) make it more enjoyable?